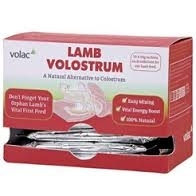 Volostrum Lamb Colostrum. 50g. Formulated to supplement natural colostrum from the ewe where the lamb may not have received an adequate intake. It should be fed as soon as possible after birth.